Are you ready for Maison et Objet Miami? At the crossroads of two continents and their 954 million inhabitants, MAISON&OBJET AMERICAS offers you the business platform that brings together a vibrant community of designers, architects, property developers, and specifiers in Miami Beach. Here you can find the most amazing design brands and their unique furniture pieces. Take a look and feel inspired. Miami Beach is known as the sexiest place ever to go on vacations. This is the place to find beautiful people, celebrities, and much more! But there’s not all…Miami Beach is best known for its crazy and hot nights as well. So, if you’re visiting the city for Maison&Objet Americas, you need to know which are the best places to go when the sun goes down! Miami Beach is a coastal resort city in Miami-Dade County, Florida, United States. It was incorporated on March 26, 1915.The municipality is located on a variety of natural and man-made barrier islands between the Atlantic Ocean and Biscayne Bay, the latter of which separates the Beach from Miami. The neighborhood of South Beach, comprising the southernmost 2.5 square miles (6.5 km2) of Miami Beach, along with downtown Miami and the Port of Miami, collectively form the commercial center of South Florida. As of the 2010 census, Miami Beach had a total population of 87,779. It has been one of America’s pre-eminent beach resorts since the early 20th century. Maison et Objet Americas is coming guys. Miami beach is the sexiest place ever! Don’t you think? And this is the place where the first edition of Maison et Objet Americas will take place, from 12 to 15 of May. Miami is one of the biggest tourist destinations in the country and is as culturally diverse as any other big American city. It offers much to see and do in some of the best weather around and some of the most amazing luxury hotels. Take notes about the hotel you’ll choose to stay in Miami while visiting Maison&Objet Americas that will be at the city for the first time! Faena Hotel introduces to Miami Beach forty-seven extraordinary oceanfront condominium residences envisioned by Alan Faena and designed by the internationally renowned architects Foster+Partners. It is Alan Faena’s 21st Century vision of true indoor/outdoor living ingeniously designed and engineered, and meticulously constructed to exist in perfect harmony with its ocean front setting. Mandarin Oriental offers a private retreat for couples, business travelers, and anyone else seeking an escape from the crowd. Besides, the hotel operates the restaurants Azul, La Mar by Gaston Acurio, and MO Bar + Lounge. Additional hotel features include a Forbes Travel Guide Five-Star spa, private beach, sushi and pool bar, and events facilities. The hotel is within close proximity of Bayshore Municipal Golf Course and Miami City Ballet. Miami Beach Edition Hotel possesses sophisticated design sensibility. Also, it has a rare authenticity, originality and unique ethos that reflect the current cultural and social milieu. The Mondrian South Beach (Morgans Hotel Group) realized at Biscayne Bay in Miami Beach, also known as the Sleeping Beauty’s castle, is a true modern fantasy. It was designed by Marcel Wanders. Chic and dramatic living spaces are furnished with original bespoke pieces, including iconic items such as the carved chairs, milled tables, vine cabanas and the signature floating staircase. Black and gold patterned furnishings and oversized brass bell shaped lights, the kissing corners in the garden, the private party places and aqua spa bring a magical side to the atmosphere of the hotel. This Miami Beach luxury hotel in South Beach features pool, bars, nightclub, spa, views and celebrity chef. Walk to all South Beach attractions and the beach. The stunning DelightfuLL lamps may be seen at Shelbourne Hotel. Experience an Art Deco landmark in Miami with vintage chic design, dining and private beach at our luxury South Beach boutique hotel and lifestyle resort. Thompson Miami Beach is a jewel of the design mecca where Art Deco meets mid-century and Miami Modern. The stunning rooms of the hotel are designed by Martin Brudnizki with 360-degree views from a private balcony overlooking South Beach. The Hotel has two pools, a small spa, three bars and a 267-seat “classic brasserie” from James Beard Foundation Award-winning chef and Miami native Michelle Bernstein. MAISON ET OBJET AMERICAS: DELIGHTFULL HEADS TO THE BEACH! One of our favourite brands is taking over to Maison et Objet Americas in Miami Beach! DelightFULL crosses the Atlantic Ocean into warmer waters and heads to Miami to be present at the 1st edition of Maison et Objet Americas, the trade show that features le crème de la crème in decoration and home fashion by prestigious brands and designers. MO America embodies the spirit of creativity and sophistication that always characterizes the renowned worldwide fair of Maison&Object. As you know, 2015 has been a remarkable year for this trade show that celebrated its 20th anniversary in Paris last January and will launch the first Maison et Objet Americas in Miami Beach. DelightFULL will bring to MO America the charm of vintage lighting. Between a selection of 300 brands, bright colors, sandy beaches, and warm weather, the brand’s spirit will stand out. 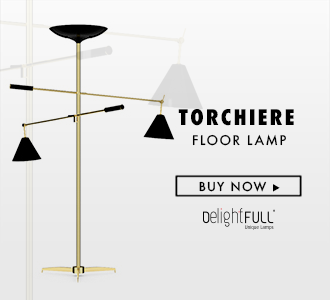 Known for always surprising the public, the brand of lighting design will feature its new member of the family, the high-end Botti Floor and other pieces that are a hit already all around the world such as the Coltrane, the Pastorius Wall, and the Sinatra Floor Lamp. DelightFULL‘s pieces are always a crowd pleasure and we hope to have a special place in the heart of the design lovers. You need to visit the most recent Peter Marino’s exhibition. I imagine you are preparing yourself already for the big trade show that is coming: Maison et Objet Americas 2015. But besides M&O Miami, there’s so much more you can do in the city. And visit Peter Marino‘s exhibition is one of those things. Marino’s doesn’t need any kind of presentation. He’s the great architect that has been befitting luxury retailers as Dior, Chanel or even Louis Vuitton. Some cultural education never hurt nobody, so you really should visit Marino’s show at the Bass Museum of Art. “One Way: Peter Marino” is the name of the show that will be in Miami Beach through May 3. And there’s just a few days left. You can find more info about this exhibition at Bass Museum of Art’s website. Visit and enjoy! Want to know some places to go if you are visiting Miami? Miami is Southern Florida’s crown jewel, and for good reasons; it has a little something for everyone, whether you’re looking to dine, drink, shop, party, relax, sightsee or hit the beach and soak up some sun. So today we bring you 10 places to go if you’re visiting Miami. Explore the best of everything the city has to offer! If your home is crying out for a facelift, then the Design District is the answer to your makeover prayers. The sight of the Italian Renaissance-style on the Biscayne Bay is straight out of a fairytale. It’s bizarre to discover a European-style palace in this beach lovers’ paradise, but visiting it is like entering a wonderland. The 19th-century Parisian façade of The Forge conceals a glitzy interior that is a rococo lover’s dream. Key Biscayne (‘the Key’ to locals) may not be as pretty as Miami Beach or attract as many beautiful bodies, but it lacks in looks it compensates for in serenity. This large outdoor swimming pool may just be the most beautiful in the world. A former quarry, the site went from pit to porticos when developers decided to convert it into a mock-Italian villa in the 1920s. Best go back to basics at the hole-in-the-wall turned microbrewery Abbey on South Beach. It offers European imports as well as several own-made beers. South Beach it’s the place to go if you’re looking to avoid sticky door policies and the sort of thumping bassline that makes it impossible to carry on a conversation. His most famous works are set in Europe and Cuba, but the quirky town of Key West is where Ernest Hemingway chose to move. The show of the exhibition or even the house itself is the family of six-toed cats who roam the grounds, many of them descended from Hemingway’s pet kitty Snowball. This is the ideal place to visit. With a futuristic design by the stellar architecture practice Arquitectonica, it’s an exciting playground with many interactive displays. It draws galleries and dealers from around the globe and showcases the work of more than 1,000 artists and over 200 galleries in the main fair alone.